The abandoned house also contains many sculptures and drawings Boyum left behind. Just a few of the sculptures in Sid Boyum's backyard. Photos by Angela Richardson. Sid Boyum died in 1991, but his artwork is still a defining feature of Madison’s East Side, particularly the playful concrete sculptures that dot Atwood Avenue. There’s even more work filling up the interior and backyard of Boyum’s house at 237 Waubesa St. which has been abandoned since his death. The Dane County Treasurer’s Office currently owns the property, thanks to unpaid back taxes—more than $12,000, according to online county property records. But advocates and admirers are trying to turn that into an opportunity to preserve the house and the artwork there, and perhaps turn it into a museum or historic site. They’re holding a community meeting Thursday night at the Hop Museum on East Wash to hear from Dane County officials and discuss possibilities for the Boyum house’s future. One item on the agenda for Thursday’s community meeting is discussing an effort to involve the Wisconsin-based Kohler Foundation. Standing says there’s a lot of uncertainty about the condition of the house and its contents—it’s possible that the many paper works Boyum left behind have been getting moldy. He’s tried to impress upon his colleagues at the county that the property has cultural value, and thinks the county taking possession of the property might actually be a good thing for the preservation effort in the long run, even though it creates the prospect of the county just auctioning it off to get it back on the tax rolls. “If it remains in private hands, someone could just decide to demolish it tomorrow and you could lose that forever,” Standing told me this week. "Now at least there’s an opportunity to say, ‘Hey, let’s be careful with how we treat this.’"
The effort's supporters also include Edgewood College art history professor Melanie Herzog. "Sid Boyum was one of many self-taught, visionary artists in Wisconsin, a state that has produced an unusual number of such artists," Herzog says. "Many people in the neighborhood know at least a bit about the artist who created these, few people seem to realize that his house was also a work of art—a unique environment that we are in danger of losing." 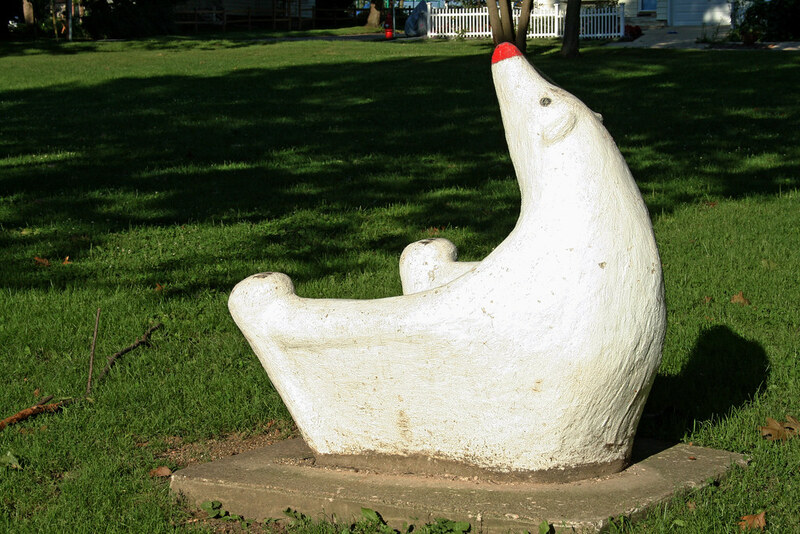 Herzog also feels a neighborhood connection to Boyum's work—she says she often walks her dog past Boyum's polar bear chair sculpture in Elmside Circle Park. Standing also feels that connection, even though he never knew Boyum, and as an East Sider himself he feels optimistic about winning the community’s support. “Getting East Siders excited about folk art is like shooting fish in a barrel,” he jokes. Anyone interested in the effort can also join the Save The Sid Boyum Art House Facebook group.